To lie in state in the United States Capitol Building is not an honor granted to many. Less than 35 statesmen have been bestowed the esteemed burial, which allows all who wish the opportunity to pay their respects to exemplary public servants. On Wednesday, Dec. 5, George H.W. Bush will lie in the Capitol rotunda. 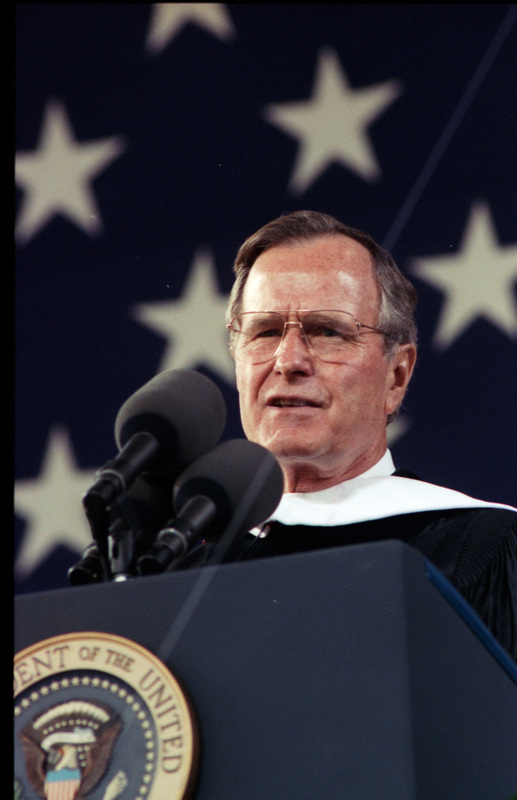 COMMENCEMENT— George H.W.Bush spoke at LibertyUniversity May 12,1990. Bush was far from an ordinary man. Representative, ambassador, CIA director, vice president, and president of the United States are titles that few, if any, resumes boast. But Bush’s long and accomplished career in politics is often not remembered for these roles, but rather for the overshadowing stigma of his single-term presidency in the 1990s. One-term presidencies are not a common phenomenon, especially in recent American politics. The patience of voters and gradually changing political climates do not lend themselves to extreme shakeups at the highest levels of government, but 1992 was a different year. Governor Bill Clinton’s charismatic, likeable style and moderate, practical policy stances outed President Bush, despite a presidency of significant accomplishment. Dealt a Democratic controlled Congress, Bush found himself economically stuck between a Republican base, which he had promised stable tax policy, and a liberal legislature, whose philosophy of deficit reduction relied solely on tax h i k e s . Bush attempted to work in a bipartisan manner to attack the deficit, only to be stopped by conservatives. Judicial nominations were met with obstruction when Justice Clarence Thomas’ confirmation process became a partisan bloodbath, reflecting poorly on the White House. The Gulf War saw the U.S. launch successful offensives in the Middle East to quell tension in the region. The North American Free Trade Agreement brought about more peaceable relations with U.S. neighbors and has seen the U.S. through 54 percent economic growth and 25 million newly created jobs since its adoption in 1993 under Clinton. But it was Bush who spearheaded its efforts. Through all this success, the question of why the 41st President was trusted by voters for merely one term is perplexing, but this foreboding warning is imperative for politicians and voters to understand. Bush was mild-mannered, at times awkward, often unexciting, and rarely visibly brash. His presidency is often described as boring, paving the way for the galvanizing Arkansas governor to capture the n a t i o n ’ s heart. If modern politics has taught us anything, it is that good-natured meekness and quiet, dignified expertise rarely win the day over a bombastic, attention-grabbing show. Substance is scoffed at when empty fluff is in proximity. Sound, practical policy solutions seem to matter less and less in the presence of needless noise and fury. Bush was the standard-bearer in a new era of Republican politicians. The party’s rising stars would take note of and imitate his gentle style, learning to cultivate a dignified approach to public service that does not berate political opponents, but rather comes to the table with firm convictions combined with a willingness to find common ground wherever possible. In one presidential term, George H.W. Bush taught us more than some presidents do in a lifetime. He showed that men of character impact others and sometimes an entire nation in incredible ways, and that it is far more important to make a difference as best a person can than to worry about the whims of popularity. History, for this reason, will be kind to our 41st president, and perhaps his passing provides ample opportunity for reflection on the state of our politics and what we can learn and apply from one of America’s greatest statesmen. Who would have thought that the CURRENT occupant of the White House would make me think of George H. W. Bush so much more wistfully?